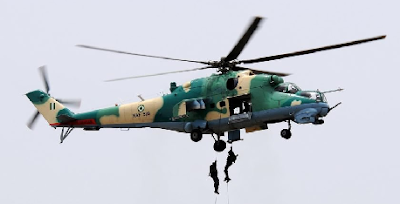 The Nigerian Air Force (NAF) on Sunday said it has carried out more air strikes against the Boko Haram Terrorists (BHT) at the fringes of Borno state, near Lake Chad, Killing scores of the insurgents and damaging their structures. It said the bombardments were conducted with fighter jets and helicopter gunships with the aim of weakening the will of the insurgents and neutralising them from carrying out their deadly activities. The Director of the NAF Public Relations and Information, Air Vice Marshal Olatokunbo Adesanya, in a statement issued in Abuja asserted that the air interdictions were conducted after a routine Intelligence, Surveillance and Reconnaissance (ISR) mission had been carried out indicating the strong presence of the Boko Haram Terrorists in Tumbun Rago and Bogumeri, Borno state. AVM Adesanya said: “The Nigerian Air Force (NAF) has intensified its air operations in Northeastern Nigeria and in the process, neutralized scores of Boko Haram Terrorists (BHT) in TUMBUN RAGO, a settlement at the northern fringes of BORNO State bordering Lake Chad. “During a routine Intelligence, Surveillance and Reconnaissance (ISR) mission on 20 December 2017, a NAF ISR platform sighted BHT activities at TUMBUN RAGO, occupied by Albarnawi faction. “Accordingly, fighter aircraft and helicopters were detailed for air interdiction over the location on 21 December 2017. “The fighter aircraft took turns to unleash their armament on the location. Battle Damage Assessment (BDA) of the attacks revealed that the targeted BHT structures were destroyed, causing fire within the location and neutralizing scores of insurgents in the process. “Thereafter, the recently acquired helicopter gunships carried out mop-up attacks on a few fleeing insurgents. “Furthermore, the following day, on 22 December 2017, the NAF neutralized a large gathering of BHTs Southeast of BOGUMERI, also in BORNO State, after a convoy of BHTs on motorcycles had been trailed to the location. “The intensification of air operations by the NAF is aimed at further reducing the will of the BHTs to continue their nefarious activities while also creating the needed advantage for own surface forces to effectively operate”.